Against | From Mosh Pits to Mars. Over the past 13 years Chicago based Rise Against have pushed 6 albums, 4 EPs, 2 splits, and 1 demo; along with a million compilations and 7 million soundtracks. Essentially, they’re as everywhere as a punk band can be. But over 13 years a band’s sound can change and mature and distort until it’s something completely different, (see My Chemical Romance). I guess punk is a bit different since there’s such an anti-establishment aura surrounding it, so maturing can often be mistaking for “selling out.” Now, the question at hand is, has Rise Against sold out? Well, let’s see. 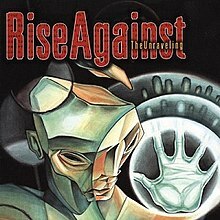 April of 2001, Rise Against releases The Unraveling, on Fat Wreck Chords. 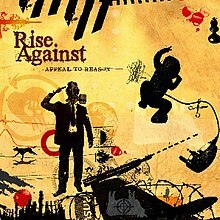 Punky, lyrical, aggressive yet contemplative, everything a Rise Against record should be. Tim was screaming about friendships, religion and things close to his heart, it was powerful and personal and just all around amazing. Fast forward 2 years, replace a guitarist, and you have Revolutions Per Minute, still on Fat Wreck Chords, still essentially the same album. The songs are a bit longer, a little less punky, but for the most part it’s hard to tell songs on one album from songs on the other. This is the base of Rise Against, these two albums make up the foundation for what the band stood for at the time, and is ultimately what their newer releases are all compared to. Along with the slightly longer songs, the band also changed lyrical content, songs are still about religion and the general struggles of life, but now the world of Rise Against, has a much more clear antagonist, government. The Sufferer & the Witness was Rise Against’s 4th album and it continued to run in the same direction that Siren Songs of the Counter Culture did. 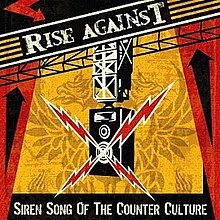 Less punk, more radio, but interestingly enough The sufferer & the Witness has some of the strongest lyrical content in the entire Rise Against catalog. Overall, the trend thus far is that Rise Against started as a hard, heavy, fast, and intelligent punk band and transformed into a more radio friendly, less punk, less personal, and more “wordly” band, interested in politics and humanity above all else. Finally we come to Endgame. This album, like The Sufferer & the Witness, polishes the sound of the album before it. So much tot he dismay of early Rise Against fans, The Unraveling sound seems to be gone for good. More rock, less punk, more radio, less soul; but did they sell out? No, they didn’t. They’ve always been an introspective and intelligent band. They always wrote about the struggle of people and their oppressors, religion or politics. Over the last 13 years they’ve just focused more and more on those points and on Tim as a lyricist. There’s only so much room on a song and if you’re going to say a lot with words, you’re going to say less with guitars, that’s what happened with Rise Against. So no, they didn’t sell out, they grew up, and I miss The Unraveling more than anything, and I don’t much appreciate Endgame, but you can’t fault a band for growing up.